There is an active abhorrence between blood thinner medications and ENT surgeons. Not only do blood thinners markedly increase risk of nosebleeds which often require nasal packing (even without surgery), but it can complicate any type of sino-nasal surgery, particularly septoplasty and sinus surgery. 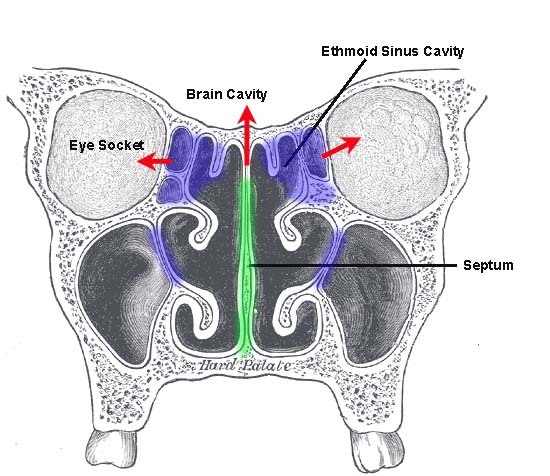 With septoplasty or sinus surgery (collectively called sino-nasal surgery), not only is the nasal mucosa is actively cut but bone is fractured and removed as well. An active persistent nosebleed after such surgery is common for 24 hours to as long as 10+ days. With blood thinner use, an ordinary typical post-surgical nosebleed can markedly increase such that nasal packing will certainly need to be placed to stop it. Not only is the risk of a bad nosebleed higher after sino-nasal surgery when blood thinners are present, but also the risks associated with nasal packing itself are also higher. After all, nasal packing applies pressure to any mucosal bleeding thereby stopping the nosebleed. It shouldn't matter if blood thinners are present or not... right? Unfortunately, it DOES matter especially when sino-nasal surgery has been performed. The key difference associated with sino-nasal surgery is that bone is fractured and removed. Bleeding within bone (after fractured removal) can be stopped as long as there's nowhere for the blood to go and clotting occurs normally. Unlike for mucosal bleeding, nasal packing does NOT compress and stop bleeding that occurs within the bone. 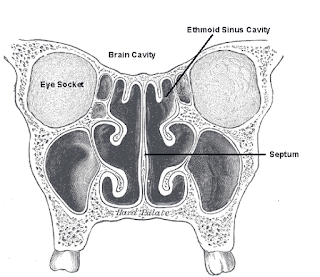 Rather it only prevents the blood from coming out of the bone and into the sino-nasal cavity. The bleeding would still be occurring internally within the bone itself until it clots off. The ONLY other way for any blood within bone to go other than out the nose is to go behind the eye (retro-orbital hematoma which puts patient at risk of permanent blindness) or up into the brain (intra-cranial hemorrhage which can potentially be life-threatening). Normally, these risks are not a concern EXCEPT if there is a large enough crack in the bone separating the nasal cavity from the brain and eye sockets allowing blood to pass through. However, keep in mind that micro-fractures are invariably present, even if surgery is perfectly performed. with nasal packing after surgery. As such, overall risks are much higher when blood thinners are present because internal bone bleeding will continue (due to the blood thinner) even if nasal packing has been placed. However, if clotting function is normal, than the bleeding within the bone will quickly and automatically clot off before it causes any significant problems. Most ENT surgeons will do everything possible to prevent the need for nasal packing after sino-nasal surgery (mainly for patient comfort, but also to allow a "safer" way for any bleeding to come out), but if blood thinners are present, many of these interventions may not work and nasal packing will HAVE to be placed. Indeed, if bleeding occurs behind the eye or up into the brain, the first step to take is remove the nasal packing to allow blood to come out the nose instead. As such, in order to minimize bleeding risks, it is essential that any blood thinners be stopped one week prior to sino-nasal surgery and ideally up to 2 weeks after surgery (given nosebleeds can commonly occur for up to 10+ days after sino-nasal surgery). Of course, if the risks of not taking a blood-thinner is too high, than hard choices need to be made on the timing of the sino-nasal surgery. If the surgery is elective, it may be better to wait until blood-thinners are no longer medically required. Blood thinners encompass two different classes of medications that work by different mechanisms: anticoagulants and antiplatelet. Anticoagulants include warfarin (coumadin), heparin, dabigatran (pradaxa), apixaban (eliquis), edoxaban (savaysa), and rivaroxaban (xarelto). Antiplatelet medications include aspirin, ibuprofen, clopidogrel (plavix), dipyridamole (persantine), and ticlopidine (ticlid). Theoretically, no matter the medication, most patients will have normal ability to clot after stopping a blood thinner for one week. However, some newer medical agents theoretically require a shorter period of time before bleeding risk is minimized. However, given that bleeding complications of sino-nasal surgery could potentially be devastating and there may not be any easy way to neutralize the effects of some blood thinners, many ENT surgeons will specify being off all blood thinners no matter what kind for minimum one week prior to surgery and for 1-2 weeks afterwards, especially if the surgery is elective in nature. Another reason is because unlike for warfarin which utilizes PT/INR, there is no test to measure how thick or thin the blood is for many of the newer agents (if a reliable test could be performed, than there would be less "fear" of bleeding complications after surgery performed more quickly). In any case, here is a list below of how long it takes for blood to "theoretically" normalize after stopping a blood thinner.